Sue and Barbara have known each other for many years, but taught at different schools. Realising that they were so alike in their philosophy and methods of teaching people and training dogs they joined forces to form Tip Top Dog School in the spring of 2007. It is Dr Ian Dunbar who has brought positive and motivational dog training to the fore throughout the past 20 years and it is his methods that have greatly influenced both Sue and Barbara. Turid Rugaas is another renowned trainer who has taught Sue and Barbara how to read dogs body language and their loose lead walking technique is based on Turid’s. This involves no harsh lead jerks and check collars. Barbara is the ‘studious’ one of the pair and Sue is the ‘hands on’ one. They complement each other and this in turn adds strength to their combined knowledge and expertise. They are constantly gaining new knowledge through study, courses and seminars. Both Sue and Barbara are both working towards accreditation on the Kennel Club Accreditation Scheme for Instructors in dog training and Canine Behaviour. Every year they attend various seminars and courses around the country on various aspects of dog training and behaviour to improve their skills and knowledge. 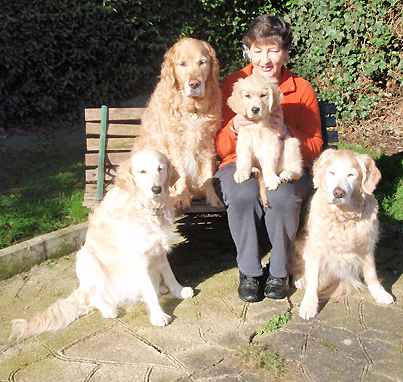 Sue has had the pleasure of sharing her home with golden retrievers since 1988 and started her ‘doggy’ education in earnest in 1993. So far there have been eight Goldies – three of which were rescues and the other four were puppies. She has enjoyed training her dogs to various standards in several sports - agility, gundog work and on a lesser scale, flyball. Having put her dogs through the Kennel Club Good Citizen Scheme up to Gold level she has been involved in demonstrations at various shows up and down the country including Discover Dogs. Three of Sue’s dogs have been Therapy dogs and Ripley brings joy to the residents of the Dr French Memorial Home on his weekly visits. She is an Affiliate Member of the British Institute of Professional Dog Trainers and gained her Second Grade Certification in 2006 and The Instructor’s Certificate (Merit) with the P.D.T.I. (Pet Dog Trainers Instructors Association) in 2007. 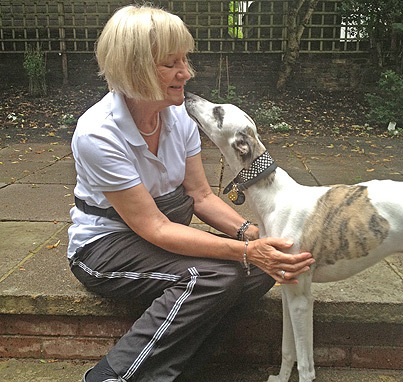 Sue has completed a behavioural course on Common Canine Behaviour Problems in 2010. Barbara grew up in a breeding/showing environment and in recent years has had two rescue dogs, an Irish Water Spaniel and a Lurcher. Rescue dogs can come with all sorts of problems and Barbara’s two were no exception. This led her to back into formal education - studying canine behaviour and learning how to teach other people how to train their dogs. Casper is one of very few Lurchers to pass the Gold level of the Kennel Club Good Citizen Scheme! He has also participated in agility displays and heelwork to music. Barbara has a special interest in teaching clicker training and has personally achieved CAP1 and CAP2 with Distinction. She has attained The Introductory Instructor’s Certificate (Excellence) with the P.D.T.I. (Pet Dog Trainers Instructors Association) in 2007. Barbara is currently studying for the Advanced Diploma in Canine Behaviour Management.